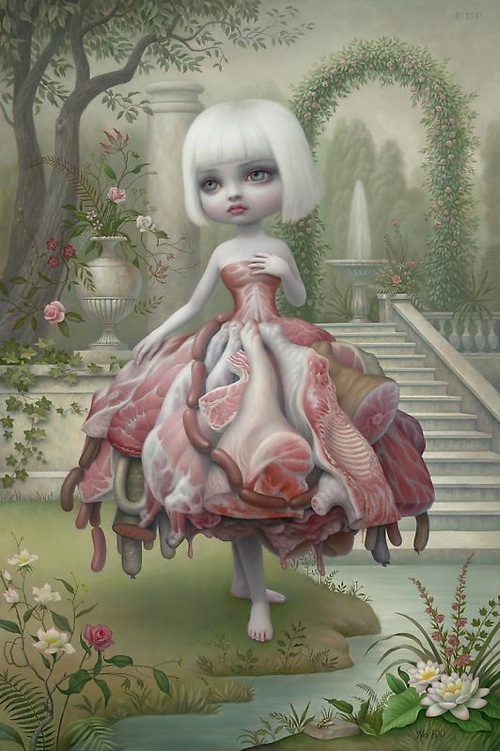 The Gay 90’s: Old Tyme Art Show featuring the work of Mark Ryden opens on April 29th at Paul Kasmin Gallery in New York City and runs through June 5th. The central theme of The Gay 90s: Old Tyme Art Show references the idealism of the 1890s while addressing the role of kitsch and nostalgia in our current culture. “In the modern era, sentimentality and beauty have been disdained in the art world,” he explains. “This new work is explores the line between attraction and repulsion to kitsch, and between beauty and banality.” Through their visual richness and symbolic complexity, Ryden’s infinitely suggestive dreamscapes invite us to enter their world and to indulge our sense of wonder. Here’s a time-lapse video of Mark painting “Incarnation”, which will be on display at the show.